I’m firmly convinced that there is no better dessert in this world than Maple Bourbon Brown Butter Peach Pie. Yes, I said it. I, the fruit skeptic, the haphazard baker, the Thanksgiving-dessert-skipping monster (seriously, who turns down a slice of warm apple pie?!) made this pie twice in one week. It was just that delicious. And I will make it again. And again. Andagainandagainandagain a million times over. Infinity times. As you may or may not know, making pie is a daunting task. I will not lie to you. The fruit will sometimes surprise you by being sweeter or juicier than you expected. The crust will sometimes get mushy no matter how long you chill it. The streusel topping? Who knows what goes wrong when it looks perfect at first and then winds up in a melted pile of sugary butter when you cook it!? But you can’t go into the kitchen with that attitude. You need to believe that your pie is going to be the best damn pie ever made. Pies can sense your fear. Or maybe that’s sharks? Shark week and pie week overlapped, and I really can’t remember. I think maybe it’s both. It’s definitely both. The point is, don’t be intimidated. 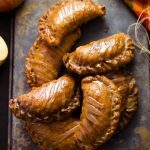 You’ll find that a lot of the steps are much simpler than they sound, and after trying it once, your next adventure in pie-dom will be much easier. It gets easier every time, in fact! Anyway, the nerve-wracking pie-making practice is so, so worth it when you pull a warm pie from the oven, with flaky all-butter crust, sweet toasted pecan and brown butter streusel, and a maple bourbon caramel coating each juicy peach wedge. Then you top it all with a heaping scoop of vanilla bean ice cream and you die and go to heaven. I have to thank my good friend, Elysse, for helping me with this pie, because I’d have been lost without her. She made pie making easy and fun, so I’m going to tell you all of the fool-proof tricks she shared with me. YOUR PIE WILL BE AWESOME, THANKS TO ELYSSE. Everyone, a round of applause for the baking queen! But anyway, back to the Maple Bourbon Brown Butter Peach Pie. This pie got two thumbs up from everyone that tried it. My grandparents stole half of one of the pies to bring home because they loved it that much. Then they came over again and ate more. My brother and mom, who aren’t big dessert fans, had a few slices and “couldn’t stop themselves”. Amanda, who worked in a bakery for about a third of her life, said that this was one of the best pies she’s ever tasted. Do you need more convincing to make it? If making homemade crust (you can also use frozen or refrigerated pie crust), start with that. Pour one cup of cold water into a bowl and add in a few ice cubes. Set aside. 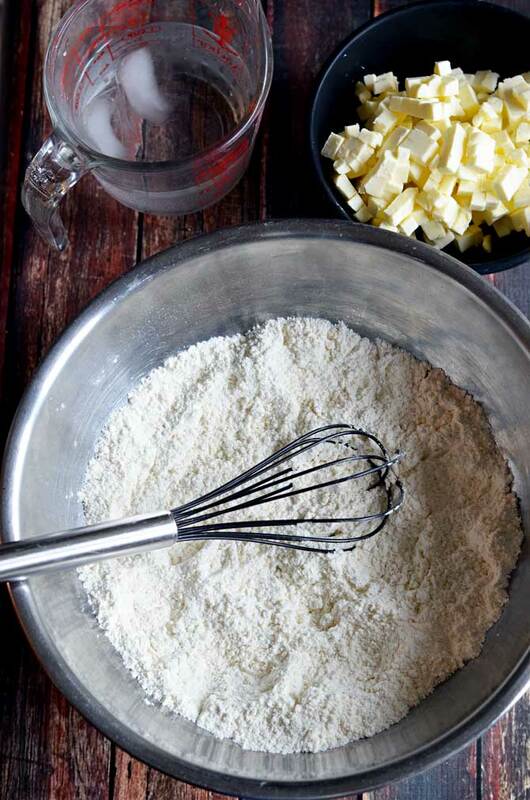 In a large bowl, whisk 2 1/2 cups flour, 1 tablespoon sugar, and 1 teaspoon salt until well-combined. Use a pastry blender or food processor to combine the flour mixture and butter pieces until the butter is broken up into pea-sized pieces. DO NOT OVERMIX! Drizzle half of the ice cold water over the mixture (making sure not to accidentally pour in any ice cubes). Using a rubber spatula, mix together the dough until large lumps form. Use your hands to knead it all into one smooth ball. Divide the dough in half, shape into disks (balls first, then flatten a bit), and wrap in plastic wrap. Let chill in the fridge for at least an hour and a half before rolling out. Stays good in fridge for one week, longer in freezer. When your dough is ready, flour everything. Your counter, your rolling pin, the dough itself. You want a lot of flour. Press your rolling pin down in the center of the dough disk and push outward. Roll in that direction a few times, then lift and do a quarter turn and roll that direction a few times. Continue rolling, turning the dough, and rolling again until the entire crust is rolled out into a 12″ circle. Work quickly, you don’t want the dough to warm up. Place the pie crust in your pie pan and fold the excess,overhanging dough underneath, so the pie is now the size of the pan. 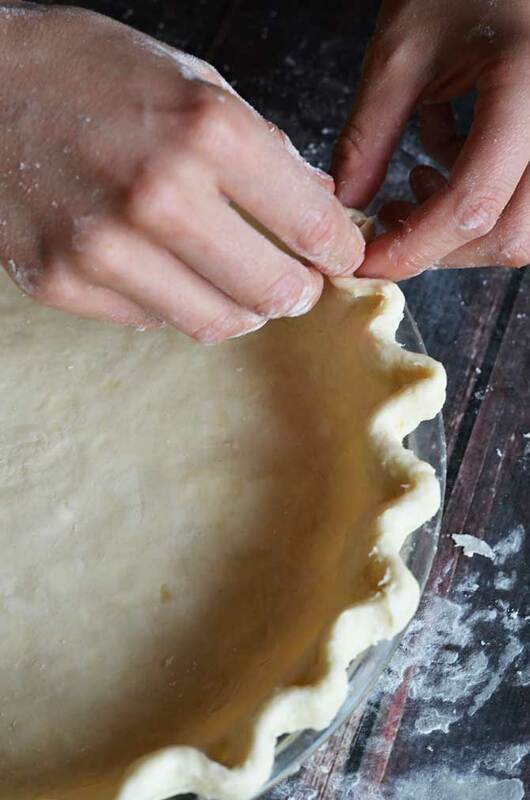 Crimp the pie crust by making a “V” or pinching shape with your thumb and forefinger on the outside of the crust. Then, using your other pointer finger, push the crust from the inside to fit in between the V-shaped fingers. Continue all around the crust. Refrigerate for another 30 minutes. As you wait for your crust to cool, make the filling. Peel and slice the peaches, and then toss in a large bowl with the cornstarch, flour, cinnamon, salt, and allspice. In a small, heavy-bottomed saucepan over medium-high heat, combine the sugar, maple syrup, bourbon, and water. Stir JUST UNTIL the sugar dissolves and then let come to a boil. Resist the urge to stir while it boils. Swirl the pan occasionally to make sure the caramel is browning evenly, but DO NOT STIR. Once the caramel turns an amber color, remove from heat and add in the butter, swirling the pan until the butter completely melts. Pour the caramel over the peaches and mix well. 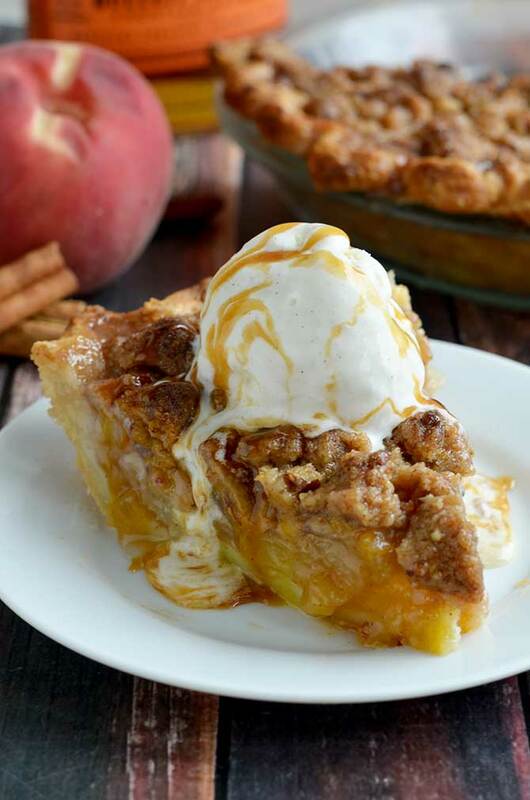 Pour the peach-caramel filling into the prepared pie shell and place in the refrigerator once more. Sprinkle the pecans on a baking sheet and toast for 5 minutes. Remove and set aside until cool enough to handle, then chop. In the same small, heavy-bottomed saucepan you used for the caramel, melt a stick of butter over medium heat, stirring frequently. Cook until the butter turns golden-brown. Set aside. Whisk together the 1 cup plus 2 tablespoons flour, 1/2 cup sugar, 3 tablespoons dark brown sugar, 1/4 teaspoon salt, and pinch of cinnamon. Mix in the pecans. Drizzle over the browned butter (which now should be slightly cooled) and mix until crumbs form. Crumble the streusel mixture on top of a rimmed baking sheet and place in the refrigerator for 15 minutes. Remove the filled pie pan and the streusel from the refrigerator. Sprinkle and crumble the streusel over the pie filling until the pie filling is completely covered. Cover the pie crust with foil and put in the oven for 15 minutes. Make sure to put a baking sheet or pie drip catcher underneath, as it WILL bubble over and make a mess! Remove the foil, reduce heat to 350 degrees F, and cook for an additional 30-40 minutes. The crust should be golden brown and the caramel should bubble when the pie is ready. Cool for at least 3 hours. DON’T EVEN THINK ABOUT SLICING THAT PIE WHEN IT COMES RIGHT OUT OF THE OVEN! It will wind up a gooey mess. After cooling for at least 3 hours, slice and serve with vanilla bean ice cream. After step 18 you don’t mention when to add the pecans. Before the foiled baking, after removing foil or after baking altogether? Thanks for pointing that out Ezekiel! I fixed it now, the pecans should be added after whisking together the streusel ingredients. Hey Morgan! 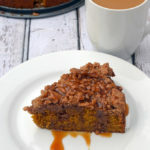 My wife and I loved your photo’s and are planning on trying this recipe at home. Also – we have fallen in love with your ice cream scoop and was wondering if you wouldn’t mind telling us where we could get one like that as well? It is pretty awesome. Hi Jack! I think I just answered you on reddit– sorry for the delay =) I actually am not sure where I got the ice cream scoop as we’ve had it since I was little, but when I get back home (I’m in North Carolina for the weekend) I will check and see if there’s a brand name or anything on it that will help me figure it out! I don’t know about you, but I think there isn’t enough recipes made with peaches. PEACHES ARE MAGICAL! The pie looks delicious. 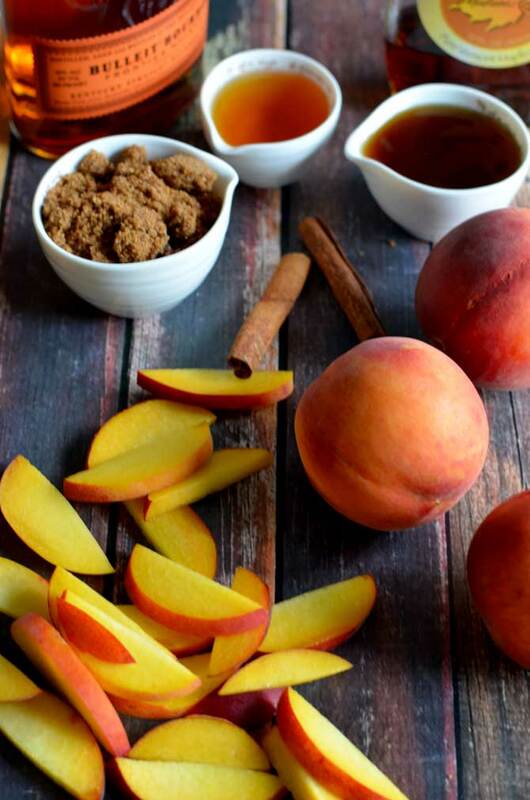 Those peaches… mhmmm! Yes that is fine Olivia, thank you! Wow, this looks awesome. 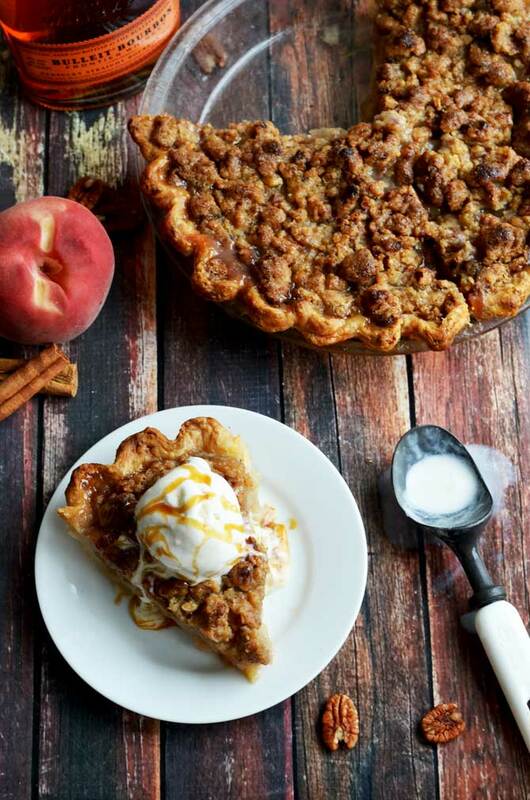 I am CRAZY over pies and definitely bookmarking this one to try soon. Wow I’m sorry I read this wrong the first time. Canned peaches should work, but I’ve never personally tried them. If using canned instead of fresh, use the same amount (3 lbs). What a spectacular looking and sounding recipe!! 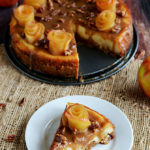 Was wondering what you thought about also making this using apples instead of peaches. So, I just pulled an apple version of this out of the oven and it smells amazing. My first observation is that I may have to double the caramel sauce for the apple version because, on the surface, it appears a little dry. I guess it stands to reason because peaches are juicier than apples. Will let you know how the tasting goes. Is going to be hard to wait! I can’t wait to hear how it tastes, Lissie!! This is probably a silly question, but do you combine the two dough discs into one before rolling out? I tried to see if you said anything about that and couldn’t find it. I’ve never made pie crust before! Thanks. Thank you so much for the awesome recipe. At my Tupperware meeting today we had a pie baking contest so after searching Pinterest I stumbled across this recipe. Although I had to use a store bought crust due to time and I used frozen peaches. Note make sure they are thawed and room temp my caramel hardened as soon as it hit the peaches and took longer to cook. But all and all it was a very good pie. So I took it to the meeting there were 14 entries I think apples, pumpkin, amaretto cheesecake, oreo, butterfinger some really good pies. There was a 4 way tie for 3rd place and 2nd and in 1st place was the Maple Bourbon Brown Butter Peach Pie I was so excited. So thanks for sharing your recipe and I will be making another 1 tomorrow for the family and 2 for Thanksgiving. Now I can play with the crust. I am gonna enter in the county fair this summer. This looks amazing! 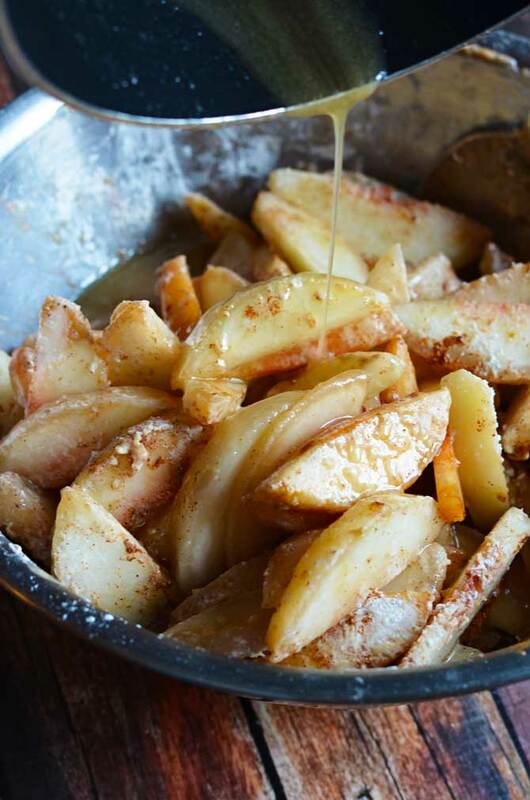 Planning on trying it with apples for Thanksgiving. Question: will it keep if made the night before? Wow! I was looking for peach desserts online and I could only find cobblers 🙁 I can/preserve everything, including peaches. I make two different kinds: vanilla and maple syrup. I can as many peaches as I can when it’s peach season in Ontario (we life close by, in Quebec). I try to use as much as what I preserve over winter, and wanted a delicious peach dessert for Christmas eve dinner! I haven’t tasted it yet, but let me tell you, it looks perfect! I made the caramel sauce with the liquid in which the peaches are preserved. So even the caramel butter had a peachy taste (oh, and vanilla and maple syrup from my uncle’s sugar shack!). Thank you for great instructions, I’ve never had such a nice crust. Only one question, I don’t get why you preheat oven at 350, then at 425…what goes in at 350? Thanks again for the great recipe! Marie-France, I’d be interested in knowing how many quarts of peaches you used and how you incorporated the peach juice in the caramel butter. Did you just replace the 1 T of water with peach liquid, or did you replace the maple syrup as well? 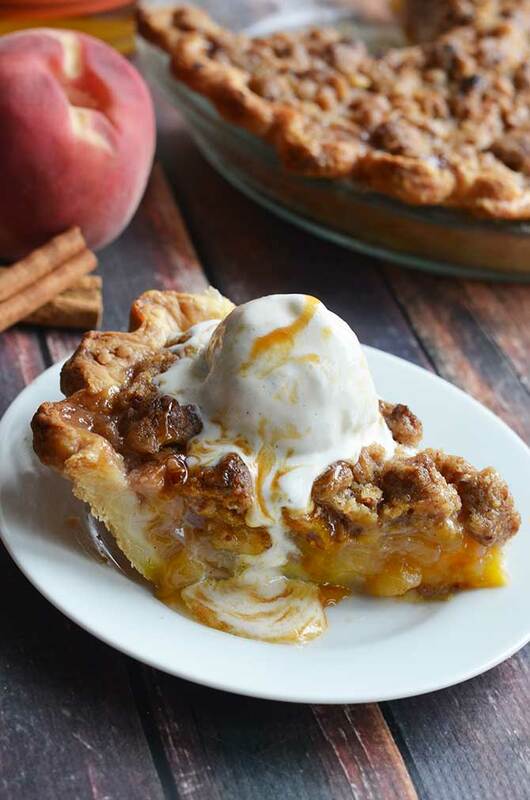 I have been on a pie baking rampage over the last several months and although I have baked several different peach pie and cobbler recipes this looks to be the most intricate of ingredients and flavors…I CAN’T WAIT TO TRY!!! Wonderful share Morgan and outstanding mouth watering photos! I’m making this recipe for the second time in a week. The first was as a gift, and I only got to try a slice with my friend, so I wanted to make it again for selfish reasons. I made this for a family get together and it was a hit! I made it with gluten free flour as my husband has Celiacs and it was absolutely delicious. The crumble on top was drool-worthy. I made it at night and stuck it in the fridge for the next day. We set it out at room temp for an hour and dug right in. There wasn’t a crumb left! Hi – this pie looks amazing and I can’t wait to make it!! Just a little confused about one thing. In the beginning you say to set the oven to 350 degrees but there are no instructions as to what to bake at that temperature. You then say to bake the pie at 425 then turn the oven down to 350. Is there a baking step that I missed in the beginning or did you mean to have the temp set at 425 from the beginning? Just want to make sure I get this right because I don’t want to mess up such a beautiful pie!! Sorry that’s unclear! I had to reread a few times to make sure I didn’t mess something up, but the 350 degree preheat is for toasting the pecans =) then the pie is cooked at 425 -> 350. This looks incredible, and that crumb topping sounds amazing! I’m thinking about making this for a pie contest at the county fair this month, so I’ll let you know how it comes out! This pie is magnificant! I have made it twice and both times it has been extremely runny. I added a little more cornstarch and flour the second time and it only helped marginally. Any suggestions? I’m glad you like it, but sorry to hear that you’ve had issues with the consistency! Could it possibly be that the caramel has been too thin? Thickening the caramel more may help, or adding more cornstarch and flour if you live somewhere humid that could be adding excess moisture to your mix (or if the peaches are slightly overripe and therefore breaking down more when cooked). Sometimes I have to adjust for those reasons. Let me know if that helps! This recipe looks great! I was wondering what size pie pan you might have used? Thanks! Hi Mary, I believe the dish I typically use for this is a 9″ pie dish! Made this pie last week and no one could believe how good it was. I already have request to make it again. Good work! I am a beginner baker and really enjoy it. This recipe looks really good and I hope it will turn out well for me too. I am going to make it this weekend for my bf bday. Could you advise that if using the ripe peaches, like you suggested, would be too watery after bake? I made this pie back in January with frozen peaches and it turned out fine. The 2nd time I made it (2 weeks later) I used fresh. I think it the fresh helped the pie keep it’s form better, but the taste between the two was no different. Maybe add another tbsp of cornstarch to help with the sogginess that can happen with frozen fruit. Beautiful photos! I am anxious to try this–sounds delicious! I just pulled this out of the oven and it smells amazing! I used peaches that I picked locally and skipped the homemade pie crust for a store-bought one. I also used walnuts instead of pecans, since I had them in the house, and added some oats to the streusel for a bit of texture. This was a lot easier than I expected–the worst part was really just peeling the peaches. Can’t wait to try it; I think it’s going to be one I make a lot! What did I do incorrectly with the caramel “sauce”? I followed directions “to the letter”. Like Roxanne said on 11/18/2014, “…my caramel hardened as soon as it hit the peaches…”; I ended up with 2-3 big globs of hardened stuff. I first thought to tear the globs into smaller pieces & distribute them throughout the peach mixtures, & then I thought, “What if these caramel globs don’t melt & disperse properly, & then you’ve lost the pie/wasted all the ingredients, effort, & time?” So, I discarded the hardened caramel globs. The latter looked to me like they’d reached the “hard candy stage” were I to have used a candy thermometer. I’m sure the pie will be tasty nonetheless, BUT I hate wasting anything, especially good bourbon! Please advise, & thanks. It’s hard to say, Suzanne. It might have been that the caramel was cooked down too much. It continues to thicken as it cools, so that may have been the issue? Can you use light brown sugar instead of dark brown? hi! what size should the pie pan be? 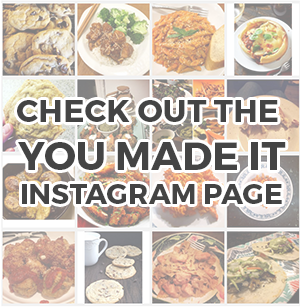 Hey I just wanted to say thank you for an awesome recipe! I just made this for a little competition with some friends and this pie won by far (out of seven other pies). I’m in South Korea so I did have a problem finding peaches since they’re not in season. I looked all over and finally decided to try using cherries (1000 grams) and it turned out perfectly. Everything else in the recipe was the same from the crust to the topping! I have to try it someday with peaches but cherries tasted amazing! Thank You! I made this pie yesterday and it have to say it’s outstanding. I used my own crust recipe but other than that I followed the directions perfectly. On the next one I may pre-bake the crust for about 10 minutes so that the bottom crust won’t get soggy. I didn’t quite understand why you put everything in the refrigerator and leave it there until ready to bake. It seems that way that the pie would have to warm up before it could start cooking in the oven which would increase the likelihood of a soggy crust. That said, this ones a keeper and I will be baking this one again. Hi Morgan, this peach pie looks incredible! I am making it tonight to take to a friend tomorrow morning. Would it be best to refrigerate it after completely cooling down or can I leave it out covered at room temperature? I don’t want the crust to get soggy. Do you suggest warming it in the morning? Thank you! I made this recipe and it was yummy…except my pie was WAAAAAY too runny! So liquidy it was basically like cutting into peach soup! Not presentable at all. Do you have any idea what could have gone wrong? It was a yummy pie still! Just made this for a BBQ, and it was such a hit! One of the best pies I’ve ever made. A little time consuming but totally worth it! I’m thinking about making and freezing the filling while I have nice fresh peaches available and then cooking the pie in October for my husband’s birthday. Do you think that would work? Working on this pie right now, it’s in the oven as we speak. I had the same issue as a few others with the caramel. When it went on the peaches it turned incredibly hard. I think maybe the confusion comes from phrasing it as “deep amber” in color. When I looked back at your pictures, that color to me was far lighter than mine, and not what I would ever consider deep amber. Because I was waiting for it to turn this color, I let it cook for far too long. The caramel should cook to a darker color than in the photos– mixing in the butter should lighten it up to what you see there, though. I agree that the wording could have been misleading. Based off of your feedback, I reworded it. Thank you so much for the suggestion, and I hope that you wind up loving the pie! I have this pie in the oven as I’m typing, and I’m already 15 minutes over the recommended baking time. It doesn’t seem to be browning like I expected. Has this ever happened to you? I’m just going to keep going until it’s more bubbly! I made this pie last night. Holy Moly does it take a long time to make, but it looks amazing when it’s done! I used frozen peaches (fresh is out of season) and let them thaw completely beforehand. I added in an extra spoon of cornstarch in case it would end up too liquid-y. It did not help. I even let the bourbon mixture boil down way longer that what I thought was appropriate, to get it to a nice ‘amber” color. Next time I will be using canned peaches because the end result was a pie with semi-crunchy peaches, when I really wanted one with soft peaches instead- like peach cobbler. Also, for anybody reading this and thinking about making this pie, just buy the pre-made pie crust to save a ton of time. Seriously, the crust makes up half of the steps in this recipe! 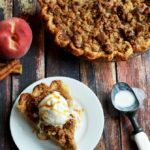 Overall, my husband LOVED this pie with vanilla bean ice cream, so it was a win. I made this pie for a pie baking contest and it won hands down! It was amazing. The first bite I had my eyes literally rolled into the back of my head haha. I do have a question though. How long before hand can you prep the pie before baking it? I have to travel for Thanksgiving but my boyfriend asked if I could make his family this pie as well. So I would have to make it the Tuesday before Thanksgiving. Will the pie be ok if I bake it all the way Tuesday night and just refrigerate it until Thursday or would it be better to prep the filling and strudel but then have my boyfriend finish the baking process on Thursday? Any advice would be appreciated! This recipe looked amazing…. so…. it’s in the oven now. I used Wolf Pecan Whiskey instead! Have you tried freezing this pie? this pie looks amazing. 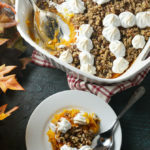 has anyone made it with homemade canned peach pie filling? I have some lovely pie filling made with clear jel, and just wondered if it might also work? This is one of the best pies I’ve ever made, and I’ve made plenty. These days, I look forward to peach season specifically in hopes for this pie. You can also add tapioca to help thicken the juice. I made this pie in a 9.5″ pie pan. It never did bubble over when it went in for 15 minutes at 425. Not sure if it was because of the 9.5″ pan instead of the 9″. Hoping it turns out good. It looks and smells delicious so far! This recipe doesn’t print well, I tried numerous times and it printed what is essentially a blank page with the exception of having the recipe name/stars/prep time etc. The second page printed the ingredients but it doesn’t print the instructions. I ended up having to copy/paste it from the page into word to get it to print normally. How much water do you use in the crust. I made this pie because of the rave reviews and my son-in-law loves pies. Well, it did not disappoint…he LOVED it and so did our neighbors that we invited over to try it. My only comment would be the 1 hours of prep time, was totally inaccurate……I was making the pie ALL DAY. We could not wait the 3 hours, I think we were at 2.5 hours and it was almost 10pm, we could no longer wait! But yum CITY!!!! We all thought the bourbon in it REALLY made it! Hello! This recipe sounds amazing!! !, especially since I am looking for something in the line of comfort food to add to my Christmas cooking right now. I am new to pie baking however so I do have one question. Should the flour be self rising or all purpose? I hope to hear from you really soon because I am so excited about this recipe that I can’t wait to try it out. All purpose for this one! Is it possible to sub apples for peaches since they’re currently out of season? Does this need to be refrigerated after cooling or left out at room temp?